Earlier this year, we launched Tableau Prep—our new data prep product that helps you combine, shape, and clean your data for analysis. It’s been incredible to see the community share their knowledge throughout the beta period (when Tableau Prep was code-named Project Maestro) and in the months following the Tableau Prep launch. 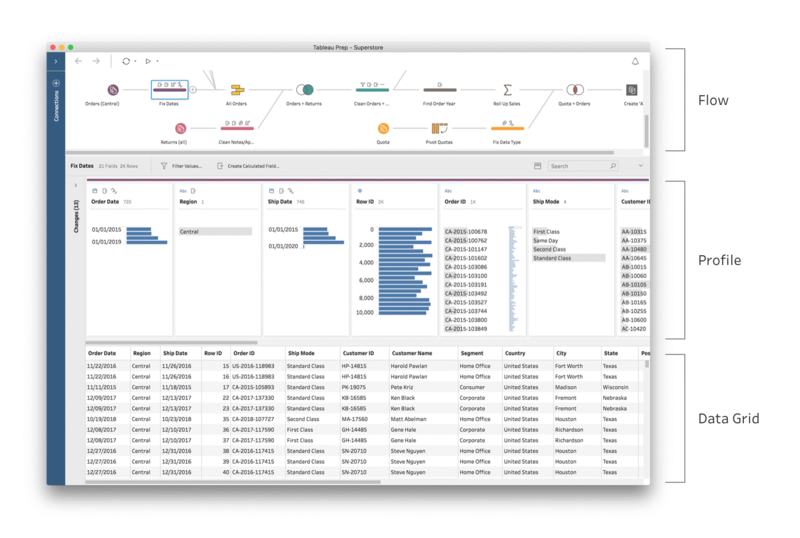 Tableau Prep has a lot of powerful features and like any new product, it takes time to learn the ins and outs. We’ve curated a list of Tableau Prep resources from across the Tableau website and the Tableau Community to help you jump-start your learning. Just getting started with Tableau Prep? These resources will help you get on the right path to becoming a data prep master. 1. Free training videos: Getting started with Tableau Prep and The Tableau Prep Interface — Learn how to get started with the Tableau Prep interface and a variety of key product features. 2. New to Tableau Prep? Start with these five fundamentals — Watch these short videos for a crash course in fundamental Tableau Prep features from Tableau product developers. 3. A sample flow in Tableau Prep (Project Maestro) — Josh Milligan, a four-time Tableau Zen Master, has used Tableau Prep since the early beta days. He shares a sample flow that acts as a comprehensive introduction to the product. 4. Should I use Tableau Prep or Desktop for data prep? The answer: Why not both? — Jake Kinstler, Tableau Product Trainer, shares his guidelines for when to use Tableau Prep over Desktop for data prep. 5. The Design of Everyday Data: Data Shaping in Tableau Prep for Amateurs — Tableau Zen Master Bridget Cogley breaks down the Tableau Prep interface into “pick-it” and “fix-it” categories for easy understanding. 6. The Tableau Prep Online Help Guide — Find information about how to get started, connect to data, and complete core tasks, including an overview of the Prep interface. Build a flow using sample data with the hands-on tutorial or find information about joins, unions, pivoting and more. Tableau employees and partners answer common Tableau Prep questions. 7. Understanding and adjusting data sampling in Tableau Prep — An overview of how Tableau Prep samples large data sets for performance, along with tips for adjusting sampling options. 8. Data Prep 101: What is an aggregate function and how do you combine aggregated data? — This post covers the basics of data aggregation and how to combine aggregated data. 9. Quick tips for preparing survey data in Tableau Prep — Survey data is notoriously messy. Tableau product consultant, Archana Ganeshalingam shares the easiest ways to clean up your survey results for analysis. 10. Scaffold data with Tableau Prep to fill gaps in your data set — Have you ever worked with a data set that has critical gaps, limiting your analysis? Product Consultant, Sasha Singh shares how to scaffold data using Tableau Prep. 11. Best Practices for Tidy Data Using Tableau Prep — This guide outlines the important factors you should consider before approaching a data prep project in Tableau Prep (or any other self-service data prep tool). Instructional content, insights, and expert advice from the brilliant Tableau Community . 12. How to handle new input files in Tableau Prep — On his blog, VizPainter, Josh Milligan shares how to handle updates to existing data sets in Tableau Prep. 13. How to mimic the magic of LOD expressions in Tableau Prep — Community author Alexander Waleczek shares a step-by-step guide on how to mimic the functionality of an LOD expression in a Tableau Prep flow. 14. Getting your survey data “just so” using Tableau Prep — Tableau Zen Master Steve Wexler shares a step-by-step guide on shaping your survey data, featuring a deep dive into pivoting in Prep. 15. Split, Pivoting and Union with Tableau Prep — Watch this video from Zen Master Hall of Famer Andy Kriebel to learn how to split columns, rename fields, pivot data, and union it all back together. 16. Tableau Prep Tip: Returning the First and Second Purchase Dates — As part of a Workout Wednesday challenge, Andy Kriebel’s video shows you how to approach returning the first and second purchase dates for a customer along with how to bring them back into a single table for visualizing in Tableau. 18. How to remove duplicate records in Tableau Prep — Josh Milligan shares another helpful post around how to easily remove duplicates in Prep, with a bonus LOD calculation at the end. 19. Tableau Prep Tutorial: Joins, aggregate, cleaning, and export — Follow along with Mithun Desai as he walks through the process of creating a flow using the Superstore data source. Articles that inspire, inform, and provide context for how self-service data prep fits into the modern analytics workflow. 20. UX Notebook: Designing Tableau Prep’s coordinated workspace — Get the inside scoop on how the Tableau user experience (UX) team designed the Tableau Prep workspace. Hint: It was inspired by subway maps. 21. My first few months with Tableau Prep: What I learned and loved — Tableau Zen Master Josh Milligan shares his experience with learning Tableau Prep—from the initial beta testing period to the launch of the product. 22. Tableau Prep: First impressions from a Data Engineer — Spencer Parker from Interworks shares his first impressions on the Tableau Prep interface, data connectors, and the process of creating extracts. 23. Don’t sweep dirty data under the rug: A three-part approach to data prep — Cleaning up dirty data can be frustrating, especially on an organizational level. Slalom consultant Gordon Strodel shares a three-part approach for identifying the root of dirty data issues and solving them. 24. Dirty data is costing you: How to solve common data preparation issues — Dirty data is a common problem that can result in millions of dollars of lost revenue. Learn from experts on how to solve the most common data prep issues that appear in organizations. The Tableau Community forums are a great place to start conversations, share other resources, and get answers to your Tableau Prep questions. You can also learn more about Tableau Prep with in-person training or in live virtual training classes.